In 1922 the Parker Pipe Co Limited was formed by Alfred Dunhill to finish and market what Dunhill called its "failings" or what has come to be called by collectors as seconds. Previous to that time, Dunhill marketed its own "failings", often designated by a large "X" over the typical Dunhill stamping or "Damaged Price" with the reduced price actually stamped on the pipe. While the timing and exact nature of the early relationship remains a bit of mystery, Parker was destined to eventually merge with Hardcastle when in 1935 Dunhill opened a new pipe factory next door to Hardcastle, and purchased 49% of the company shares in 1936. In 1946, the remaining shares of Hardcastle were obtained, but it was not until 1967 when Parker-Hardcastle Limited was formed. It is evident through the Dunhill factory stamp logs that Parker and Dunhill were closely linked at the factory level through the 1950s, yet it was much more than a few minor flaws that distinguishing the two brands. Most Dunhill "failings" would have been graded out after the bowl turning process exposed unacceptable flaws. This was prior to stoving, curing, carving, bit work and finishing. In others words, very few Parkers would be subjected to the same rigorous processes and care as pipes destined to become Dunhills. Only those that somehow made it to the end finishing process before becoming "failings" enjoy significant Dunhill characteristics, and this likely represents very few Parker pipes. After the war, and especially after the mid 1950s the differences between Parker and Dunhill became even more evident, and with the merger of Parker with Hardcastle Pipe Ltd, in 1967 the Parker pipe must be considered as an independent product. 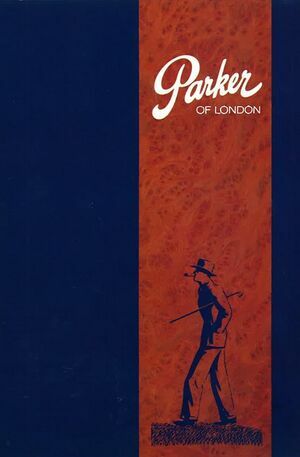 There is no record of Parker ever being marketed by Dunhill either in it's retail catalog or stores. 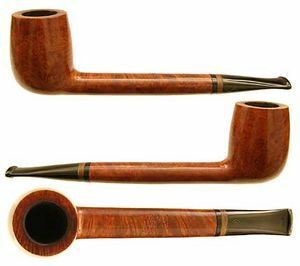 Parker was a successful pipe in the US market during the 1930s up through the 1950s, at which point it faded from view in the US, while continuing to be popular in the UK. It was re-introduced into the US market in 1991 and is also sold in Europe. 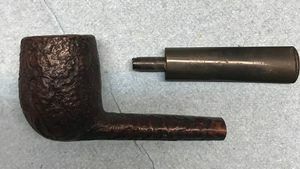 John Loring states in "The Dunhill Briar Pipe - 'the patent years and after'" that while he has seen several pre-war Parkers and some from the 1950s that appear to be Dunhill "failings" during the finishing process, briar was also obtained from sources other than Dunhill. 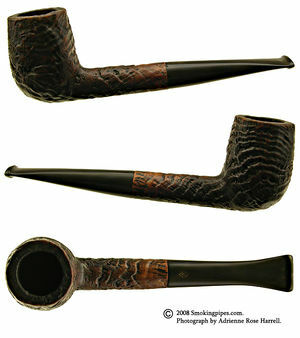 Loring knows of no way to distinguish the briar source when looking at either Hardcastle, Parker, or Parker-Hardcastle pipes. And that aside from a very few Parkers from the 1950s and before, and a few ODA shapes, we should not expect to find any actual Dunhill production in these lines. While one might be there, it is doubtful we will ever be able to determine it. Prior to Word War II, the possessive PARKER'S stamp was used. However, at least some pipes were stamped with the non-possessive as early as 1936. Like Dunhill, Parker pipes are date stamped, but differently than Dunhill. The Parker date code always followed the MADE IN LONDON over ENGLAND stamping. The first year's pipes (1923) had no date code; from 1924 on it ran consecutively from 1 to 19. There is no indication of a date code for the war years. Parker was not a government approved pipe manufacturer, while Dunhill and Hardcastle were. During the war years Parker manufactured the "Wunup" pipe made of bakelite and clay. 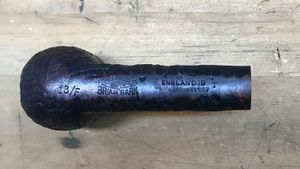 Thanks to Jason Lynn, we now have photos of the following Parker pipe with a 19 date code, indicating there was perhaps some production of briar pipes during the war years. 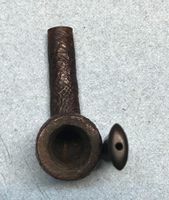 This pipe appears to have a replacement stem, or perhaps the unusual stem had to do with the war. From 1945 through 1949 the Parker date code runs from 20 to 24 and from 1950 through 1957 it runs from an underlined and raised 0 to an underlined and raised 7. A little help here from anyone with date code information beyond 1957 would be most appreciated. After 1957 on pipes Parker ceased to put patent number and the code with definition of date. This page was last edited on 18 February 2019, at 18:57.